Ready for some geometric fun? 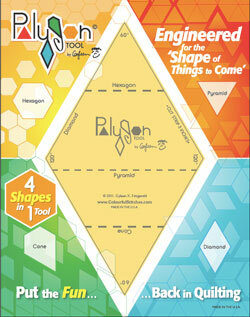 Cut diamonds, pyramids, cones and hexagons using a 3" strip. I've done all the math so the shapes interlock for endless possibilities. A great stash buster, let's use it up to clear it out and make more beautiful quilts. A stand lone tool or the perfect match with Polygon Affair Book and the Polygon2 Tool.